Since the day tenor René Barbera’s North American debut recital for San Diego Opera was first announced, the anticipation has kept Facebook and Twitter buzzing. After his extraordinary performance at SDO’s 50th Anniversary Celebration Concert last April (http://www.laopus.com/2015/04/sdo-again-proves-itself-worthy-of-must.html) local opera aficionados have hoped and wished to see and hear him again. 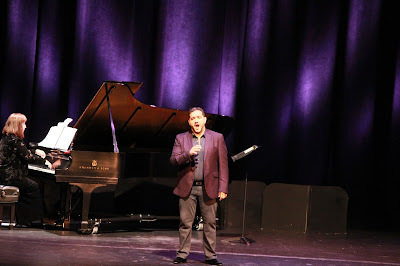 Last night those hopes were fulfilled, as Barbera enchanted the Balboa Theatre audience with his charm, talent, and sheer polish and beauty of his voice. Every moment, every note, provided sheer joy and pleasure. No matter whether he was singing to the audience from left, right or center stage, his enormous, gorgeous sound reached every corner of the hall: a kind of tenor Surround Sound. Barbera has come a long way from playing a rock on stage in Hansel and Gretel, the opera that originally initiated his affection for that art form. Already a recipient of several high profile operatic awards, he has established himself as a leading tenor in the bel canto repertoire. 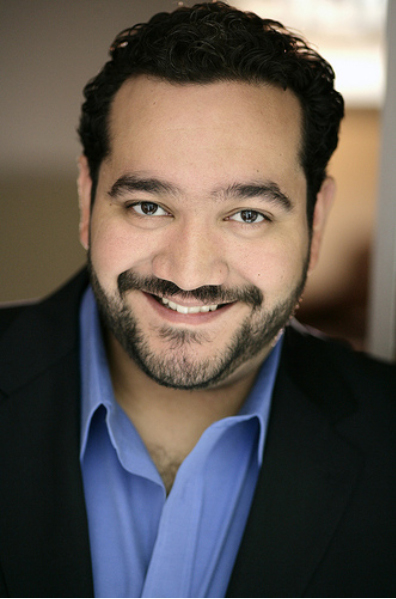 Recently he sang for the first time two roles that helped cement his reputation as a major presence: Iopas in Berlioz’ Les Troyens (San Francisco Opera) and Giannetto in Rossini’s La Gazza Ladra (Rossini Opera Festival, Pesaro, Italy). In his gracious introductory speech on stage, new SDO General Director David Bennett praised Barbera’s talent. Barbera, who clearly is in love with opera (http://www.laopus.com/2015/05/tenor-rene-barbera-is-in-love-with-opera.html), validated his affection in this concert program, a delectable tasting menu of beloved Italian, French, and Spanish favorites and zarzuela, spiced with a dash of Argentinian zest. The result was a cornucopia of operatic delights. Whatever the repertoire, Barbera made it look and sound easy, producing a vibrant, effulgent tone with seemingly effortless fioratura cascading from his voice, all with crisp enunciation in whatever language. Fresh from the Rossini Festival, Barbera started off fearlessly, with Vieni fra queste braccia from Gazza Ladra, an aria that for a tenor is like climbing Mount Everest without a carabiner. Barbera tossed off high “D”s like they were mere croutons atop a salad, whetting everyone’s appetite for the main course. But first, as appetizers, he served up four delicious Bellini art songs, performed with sensitivity and delicacy. Listening to Barbera interpret these paeans to the joys and sorrows of love would make even those for whom this composer is not a favorite (this writer among them) an instant fan. The entrée came with Bizet’s heartbreakingly beautiful Je crois Entendre Encore from Les Pêcheurs de Perles. Despite the difficulty of the language and tessitura, his French diction was impeccable and he showed no sign of strain, floating the difficult high notes with exquisite delicacy, his velvety tone staying consistent from top to bottom. Barbera added Spanish flavor to the mix with three of Fernando Obradors’ most popular love songs, ranging from sentimental to sensuous. Barbera was utterly comfortable in the language and tone of the selections. He made optimum use of his ability to spin long legato lines in the two longer pieces and displayed his fiery temperament in the vivacious final number. Ending the first half with Gaetano Donizetti’s Ah! Mes amis…pour mon âme from La Fille du Régiment provided a sure fire hit, and exceeded expectations for an audience that had witnessed Barbera’s performance of the work at SDO’s April concert. Having proved he could accomplish the feat with ease and aplomb, Barbera savored every moment; his gasp-worthy rendition was even better this time around. The audience’s cheers were deafening. Post-intermission offerings consisted of panoplies of luscious desserts, opening with Basque-Spanish zarzuela composer Pablo Sorozábal’s No puede ser. This excerpt from his most popular and operatic zarzuela La Taberna del Puerto, aka Romance Marinero (Nautical Romance), affords a tenor the perfect opportunity to show the passion and beauty of his voice and is frequently performed by the world’s iconic tenors. Barbera held his own among them, rendering the bittersweet piece with the passion of Domingo and the elegance of Kraus, rocking the audience on the sea waves of the imaginary fishing port in which the work is set. It’s no wonder that Barbera was awarded First Prize for zarzuela at Domingo’s Operalia competition in 2011. Barbera then drizzled on some 20th century piquancy with Alberto Ginastera’s Cincos Canciones Populares Argentinas. The tenor further showed his remarkable versatility in these songs, which varied from lightning fast to introspective. He followed with a generous dollop of sinfully rich whipped cream in the perennial favorite Una furtiva lagrima from Donizetti’s L’Elisir d’Amore, which he sang as though it had been written expressly for him. Capping the program were sprinkles of art songs from Paolo Tosti, Reveriano Soutullo and Juan Vert, perennial crowd pleasers - Rossini's La Danza and Augustin Lara's lilting Granada - and a gigantic cherry on top: an encore of La Donna È Mobile from Verdi’s Rigoletto. Barbera sang with a full, rich tone, flirtatiously playing up both the dramatic and comedic aspects of the Duke’s character. The audience ate it up and left satiated, yet hungry for more of Barbera’s exceptional artistry. Accompanist Cheryl Cellon Lindquist ably performed the enormous variety of repertoire and stuck to Barbera like glue - not an easy accomplishment with such a spirited performer. A distinguished opera aficionado once told me his criterion for judging the merit of an opera singer was whether he wished the artist to keep singing. With last night’s shining accomplishment as an example, this writer without hesitation would counsel René Barbera to keep singing.